Spray a glass-baking dish with non-stick spray. Wash and dry salmon fillets and place in dish. (If salmon has skin, place skin side down). Mix the remaining ingredients and pour over salmon. Cover with plastic wrap and let marinate in refrigerator for at least 30 minutes (or more if time permits). Pour off marinade into a small pot. 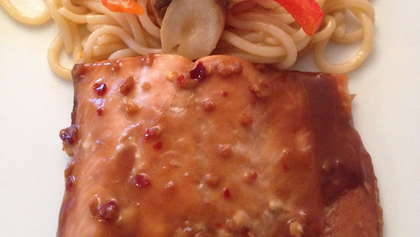 Place salmon in oven and bake 8-10 minutes or until fish flakes easily with a fork. Meanwhile boil the marinade on a low boil for 3-5 minutes and reduce by half. Transfer cooked salmon to a platter and pour remaining marinade on top.